Are You Looking for Tips About Freelance Writing Jobs for Beginners? Starting a freelance blog is like a roller coaster ride–it has its ups and downs. One minute you are having the greatest time of your life because of the freedom it entails, and another minute you are struggling to pay your monthly dues. But no matter what stage you are in, I cannot deny that paid writing jobs sure have their perks. Most of them do not required talent alone—they also asked for creativity, and the ironclad will to survive. As I was browsing on Facebook, there were a lot of ads that popped up on my Newsfeed. One of them is a sponsored one that piqued my interest–a website that offer freelance writing jobs for beginners. Now, I do not like writing (it was a struggle for me back in college). But if it could give me the financial resources I need, then I have no other option but to try my luck with it. The commission might even give me the right push to pursue writing as a career in itself. A few months later, here I am, still doing freelance writing jobs from home with my rickety old laptop and my ever-present coffee (the coffee ring is now a permanent mark on my tabletop). From Internet and SEO to Business and Finance, I write and write and write non-stop like Alexander Hamilton when he wrote the whole US Constitution in a span of six months. Some of you might be asking on how to get freelance writing jobs that are good for those who are starting out. You can ask trusty ol’ Google for this one, as there will be postings about this up online. You just need to put in some effort in finding the one that has the topics you like. Most of the good ones are based in India and UK so you can start from there. But for those who want to take a shortcut and get the best paying writing freelance jobs available, you must first take the time to establish your online presence. Whether you use social media or DIY websites, clients have to know that you exist and you have what it takes to give them what they need. In my case, I wrote a 1,200-word blog on Startupgrind.com about how to build your tech startup business and make yours stand out among the vast sea of competitors. You can access the full article here. To summarize, I enumerated three main strategies that tech startups can use to build their empire and expand their business while keeping themselves a step (or two) ahead their competitors. I put in reasons why most startups fail and what they can do to remedy that problem. As soon as my blog content was posted, I got an e-mail from a client. 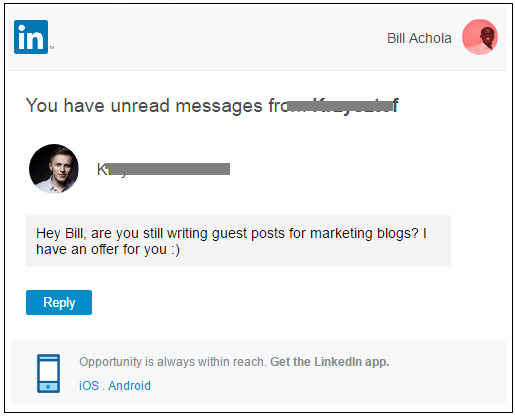 Because of the actionable content of my blog, I was able to attract this high-paying client who, as seen above, is willing to give me the opportunity to be part of his team. Here is another actionable content that I made. I promoted it using Inbound.org, a website that uses inbound marketing, a method that draws potential clients in by marketing yourself and your ideas. Instead of bombarding them with ads, we let them find us whenever they need our help using this web platform. 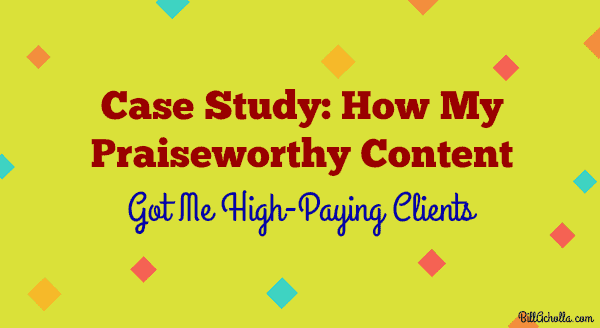 Through this online community, I was able to expose my content for others to see and gain high-paying clients in the process. A week later, I got another e-mail from a client, as seen below. By taking that first step in putting yourself out there, clients will eventually notice your work. But then again, they have to see that you have what it takes. Employing the right content writing strategies to make your output filled with the right information and actionable is important. After all, clients do not want boring content and they certainly do not want something that they have seen or read a hundred times. Give them something new. Present a different angle. A new idea. 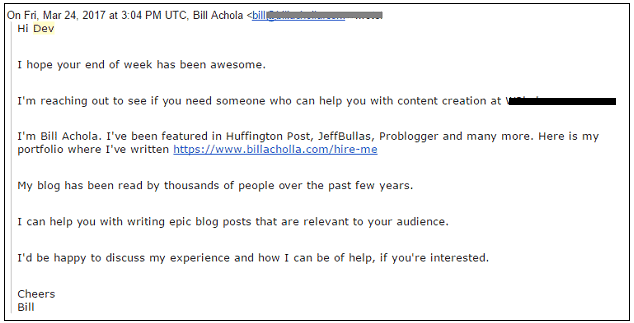 Another strategy I employ to get online freelance writing jobs is to contact the editors myself. It takes a lot of courage to do it, but the rewards are great. First, I e-mailed Jeff Bullas, a widely-recognized Internet and social media marketer and influencer. His works have been featured in networks who are big names in the industry, specifically Forbes and New York Times. Reaching out directly to editors can help in establishing your online persona and get potential clients in the process. They would come to admire your tenacity and determination–that, in itself, speaks about your drive to get the job done. They would see you as a force to be reckoned with. As for me, what started as a bold move turned into a huge avalanche of job opportunities. To help you in doing the same, let me first show you an email I sent to one of my target editors. As you can see, I have not written much aside from my credentials that can beef up my credibility as a freelance writer and my intent to write a blog for them. In the same manner, your message must be concise and straightforward. Editors do not have much time in their hands, so getting straight to the point would do them a huge favor. As shown here, editors also give quick and straight-to-the-point replies. Follow their example and do not add one too many unnecessary information in your answer, but do not lose your personality either! As you can see, I sent emails to a lot of editors. Likewise, do not rely on only one editor. Have a goal of presenting yourself to at least three to five of them (the more names, the better, but filter them to the ones who work closely on the topics you like to work on). Not all of them would reply or say Yes anyway, so you must always have other options of editors to fall back on. Finally, if all else fails, there is no harm in starting from the scratch once more. You can begin gaining momentum and experience first by joining online remote writing jobs like contena.co. Contena is a great jumpstart for budding freelance writers. With a small fee, you can access their job board to find freelance writing jobs that you can work on. They organize their board so well that writers can start working at once instead of browsing the Internet helplessly to find a topic that they actually like. They know and understand how difficult the latter is, so they’re taking on the difficult job of to collecting all of these online job listings and organizing them based on what the writer is looking for. Contena is able to provide easy freelance writing jobs that even college students who want to earn extra money for their additional needs can work on. Intermediate writers who also want to boost their work experience can benefit from their job listings. Their clientele are from some of the best companies out there, so beginner writers can expect high-paying jobs—though, do note that the quality of your output must be up to par as well. After job acceptance, writers are immediately asked to produce something based on the assignment details posted. The membership fee may be a bit expensive, but writers can think of this as an investment that would give large dividends in the long run, especially when it comes to experience and exposure to the freelance writing world. Alternatively, If you are looking for a freelance website that is free to use, check out Hubstaff Talent. Once you create your profile, potential employers can contact you directly if they feel you’d be a good fit for their gig. Establishing a six figure freelance writing business is not easy. You are required to start from the bottom to know the ins and outs of the business. But the perks of the job—having control of your time, doing only the jobs that you feel are right for you, setting your own pace–far outweighs the hard work that you will be investing. Gaining experience is a must. But luckily, there are web communities that make this easier. All you have to do is take that first step and act out. Happy writing and the best of luck! If you’ve any feedback, leave a quick comment below. Thanks for including me on your list Bill! You welcome Bryan i was thrilled by your awesome content about “25 Valuable Lessons from Seriously Successful Writers” good stuff. What a great group of freelancers. I know the majority of them. Good people! I have guest posted on a few of these sites already, both for free and for pay. What I like best about these people is that everyone is so nice and willing to lend a helping hand. I’ve modeled myself after a few of these people, too! Thanks Lorraine, you’re a true inspirational expert. Hi very good article thanks for sharing keep up the good work. hey, I just enjoy your blog it’s really helpful. Well, all the clients want to see the quality of your writing before they give you their projects. 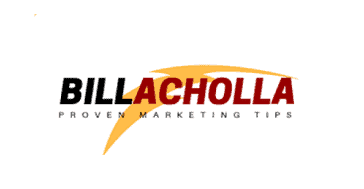 As you are looking for freelance writing jobs for beginners you are new to the client will want to see the sample. 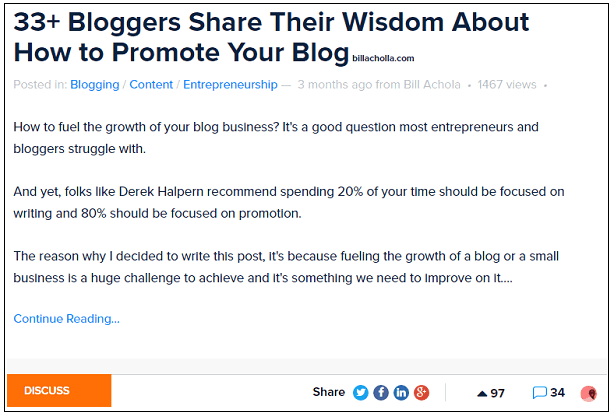 So the easiest way to create your writing sample about your niche is to create a blog about the niche and give the link of your blog post to your client. I appreciate you showing us the whole process; it helps.